View Round-the-world-trip on samandmarta's travel map. 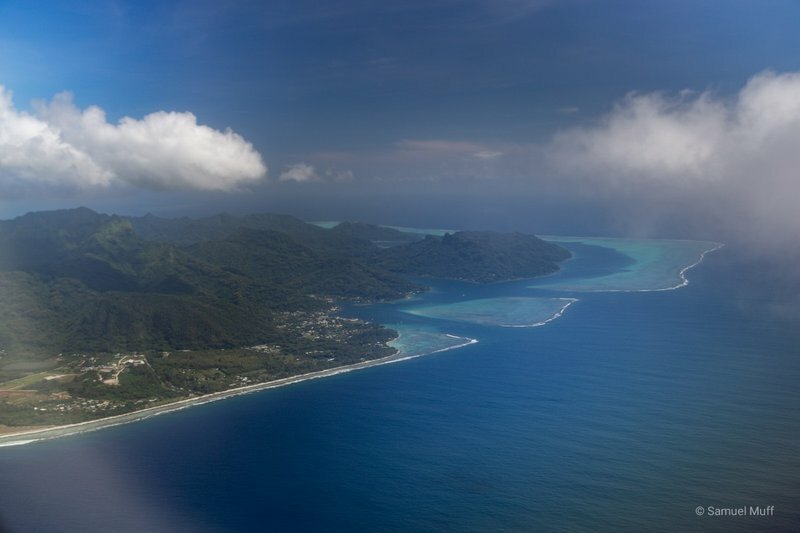 A very scenic 25 minute flight brought us from Huahine to Bora Bora, the most famous island in French Polynesia. While approaching Bora Bora’s airport, we could already see the resort where we were going to stay for the next four nights. 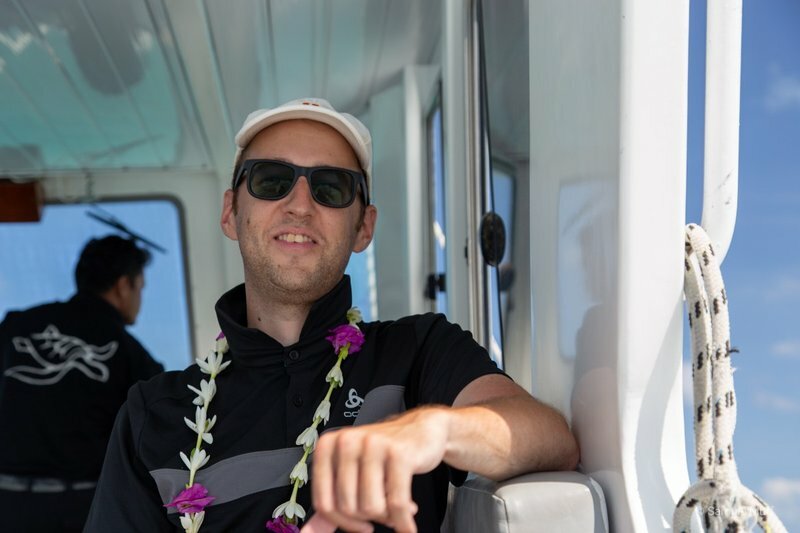 At the airport, we were once again greeted with a Lei and transferred to our resort by boat. Just when we were arriving, a wedding was happening there at the beach. Not a bad place to get married, although we doubt many friends would have come had we done ours here. 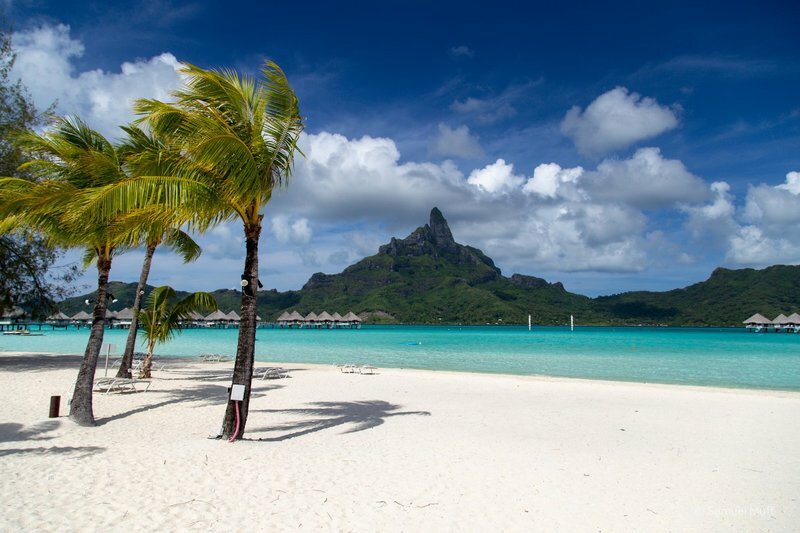 One of the most striking features of Bora Bora is Mount Otemanu, the 727 meter high peak of the island. Because our resort was located on a motu (small, sandy reef island surrounding an atoll) to the East of the main island, we had a perfect view of that jagged mountain. Especially the sunset view was fantastic and we usually admired it from the bar with a cocktail in hand. There was plenty to keep us entertained for four days. 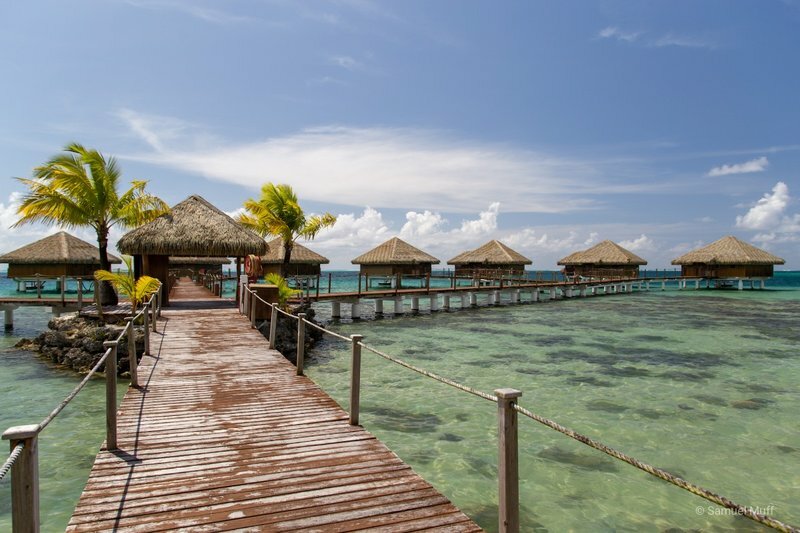 We kayaked around the motu, swam and snorkeled in our resort lagoon and even tried stand-up-paddling, which was actually easier than we expected. While snorkeling, we saw, besides plenty of colorful fish, a moray eel and two sting rays. On our first evening at the resort, there was also a nice Polynesian dance and music show which was a lot of fun. 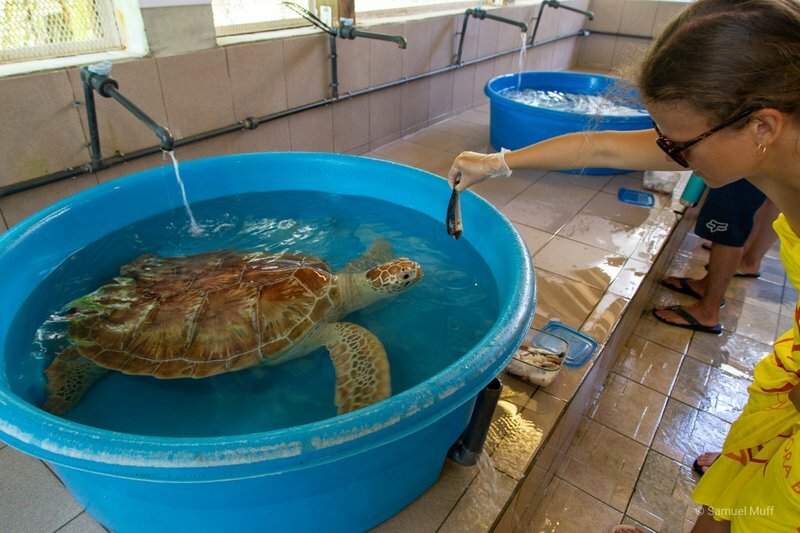 However, our favorite part of the resort was the Turtle Center, an independent operation on the resort grounds that treats injured turtles. Everyday, guests of the resort had the opportunity to help feeding the turtles, which we did twice. We loved feeding Jordan, our favorite turtle who was there with kidney problems. 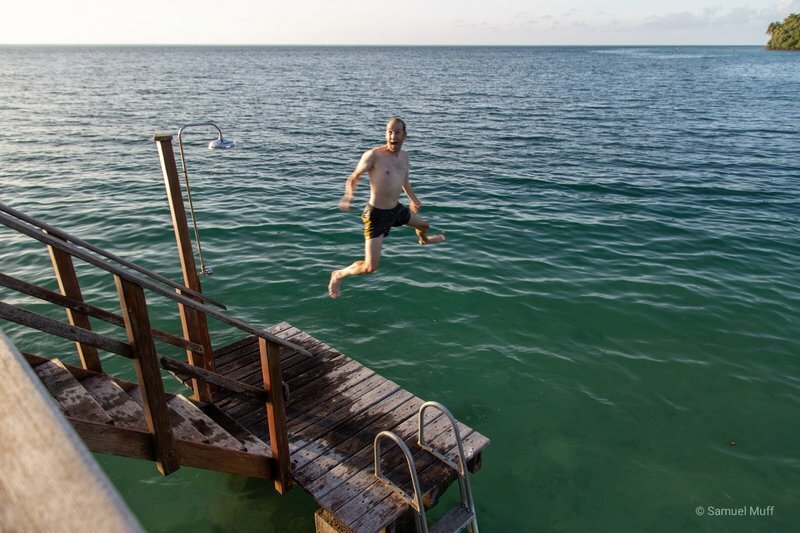 For the first two days, we stayed in a bungalow and for the last two in an overwater villa. This villa was much fancier and more modern than the one we had in Huahine. 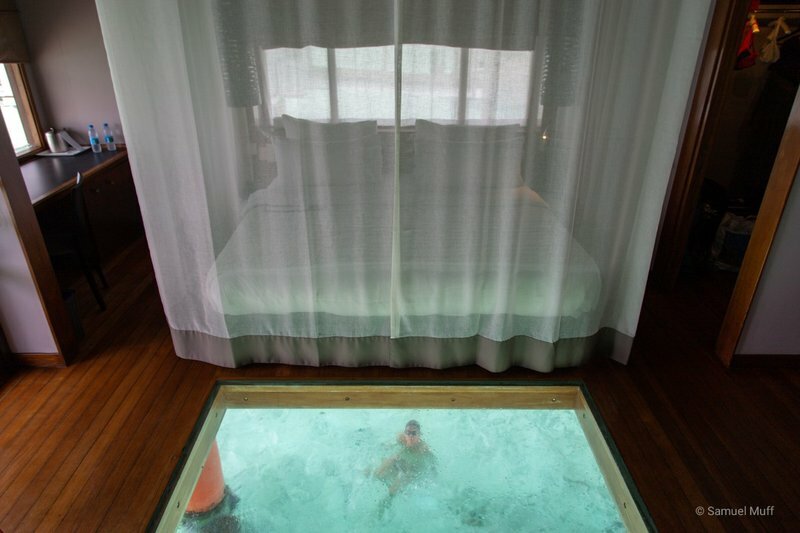 It even had a glass floor through which we could see the sea and the occasional fish passing by. We did not like it quite as much as our Huahine villa though, because the porch was much smaller, the water in front was less than a meter deep and it was less secluded and private. It was still a great experience though. Bora Bora roughly marked the middle of our trip around the world. It was also the farthest point from home on our journey, over 16 thousand kilometers from Zurich. 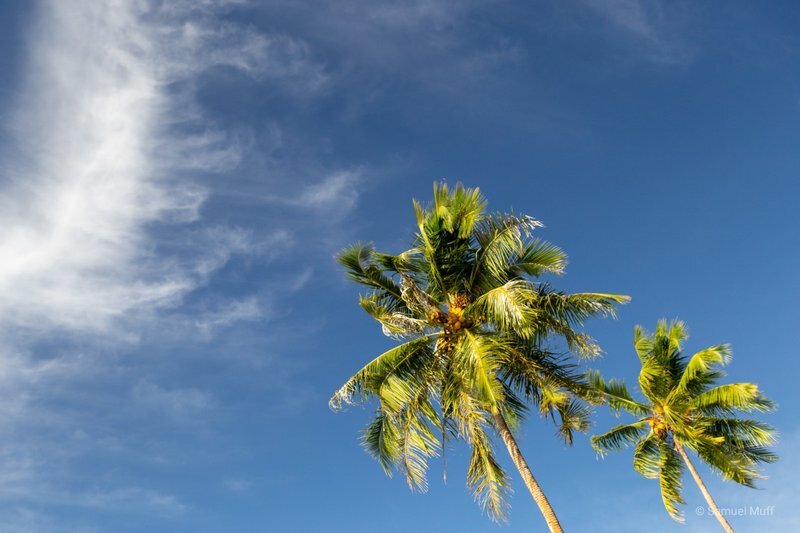 Together with Hawaii, it was the place with the largest time difference (11 hours). Therefore, our return to Switzerland is now closer than our departure and after six months of moving away from home, we now start to move towards it. 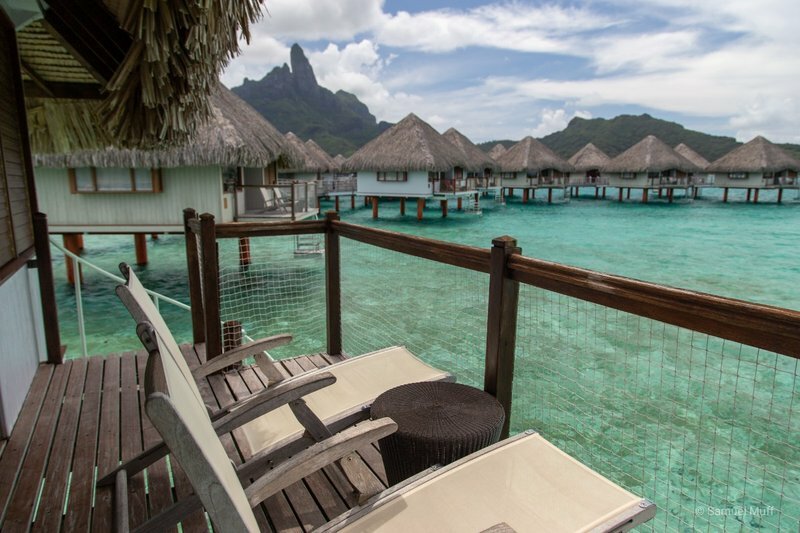 We left Bora Bora for Tahiti on the 7th of January and spent a short night there. 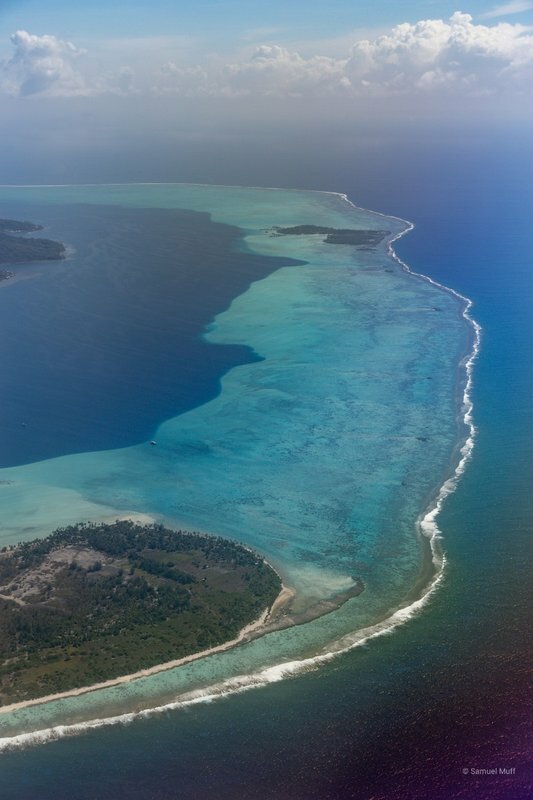 At the most inconvenient time of 3 in the morning of the next day we departed French Polynesia towards Easter Island. 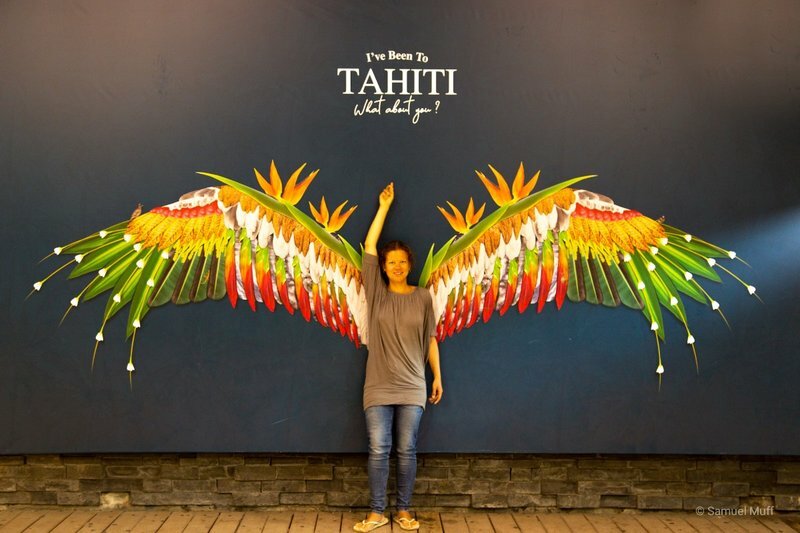 After a six hour flight from Honolulu, we arrived in Tahiti, the main island of French Polynesia. A traditional Polynesian band played at the gate and it almost felt a bit like home, seeing a special line for EU and Swiss citizens at immigration. The host for our short stay in Faa’a picked us up at the airport and welcomed us with a Lei. 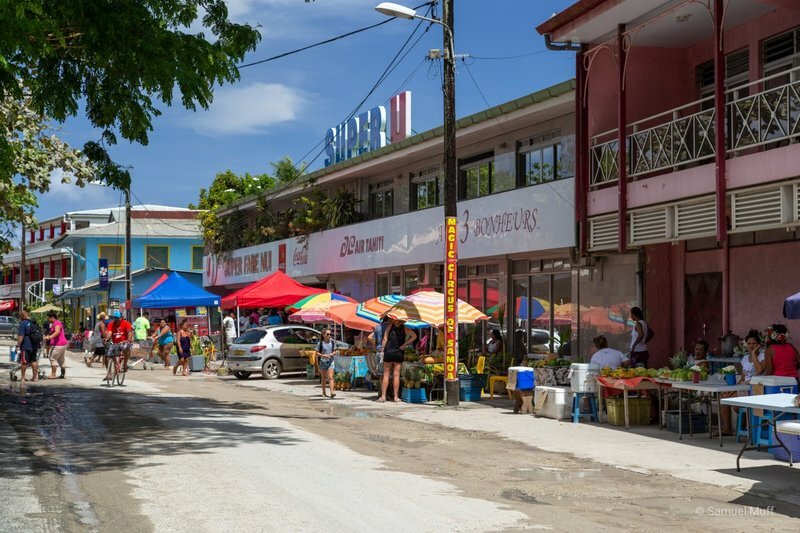 Despite the fact that the official language in French Polynesia is French, we felt that the country is much more in touch with its Polynesian roots than Hawaii. Early the next morning, we departed for Huahine, where we were going to spend four nights, including New Year’s Eve. 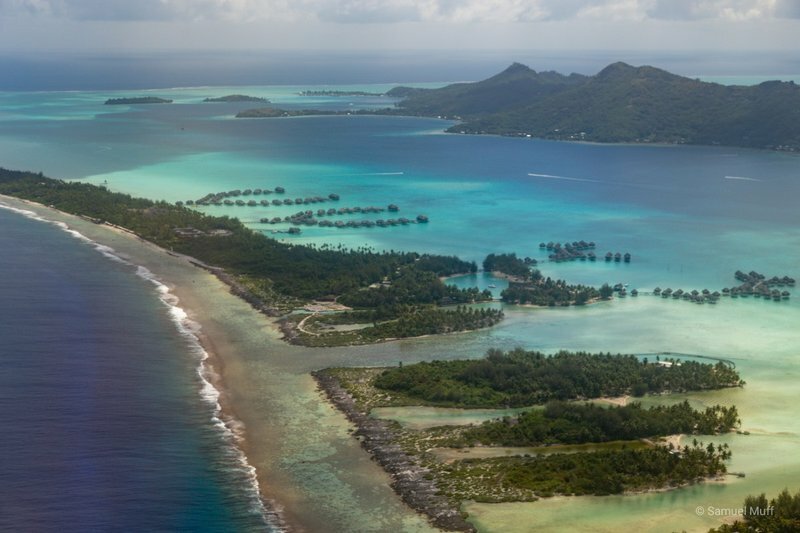 Huahine is one of over 200 islands and atolls in the vast territory of French Polynesia. 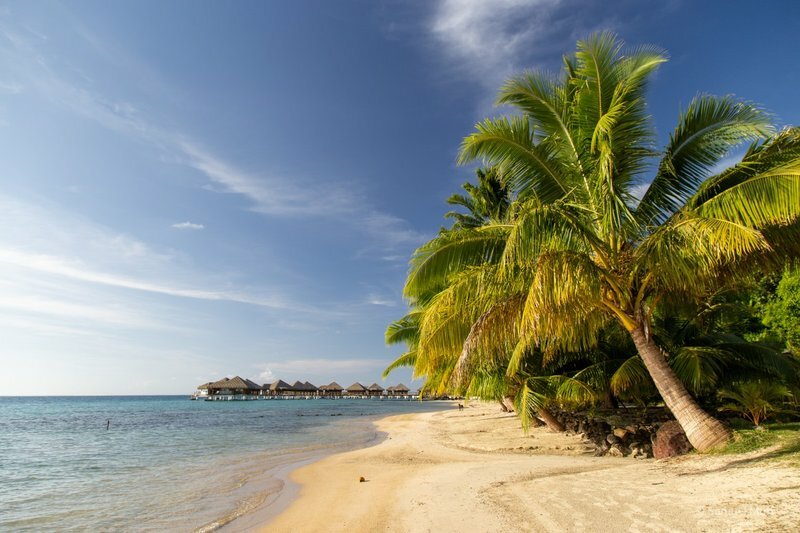 It is part of the Society Islands, a group of islands that are quite developed and easy to access. 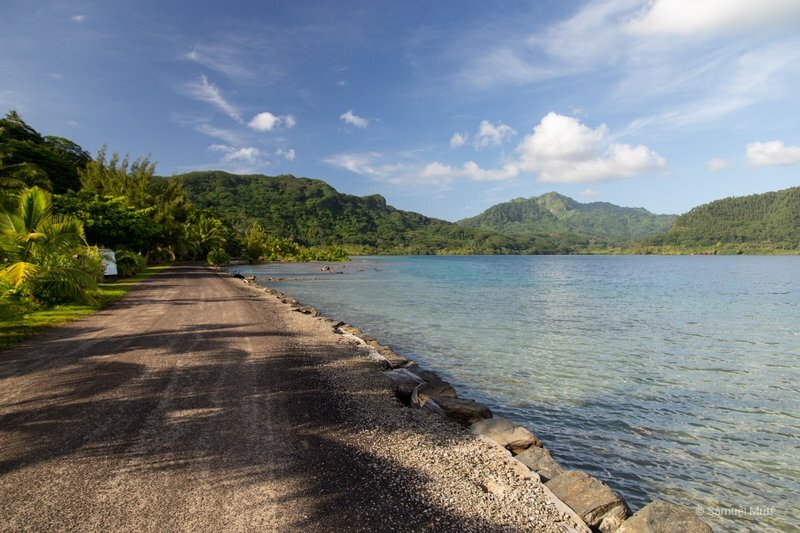 We chose Huahine because we wanted to experience staying in an overwater villa and we found a relatively affordable resort for this here. 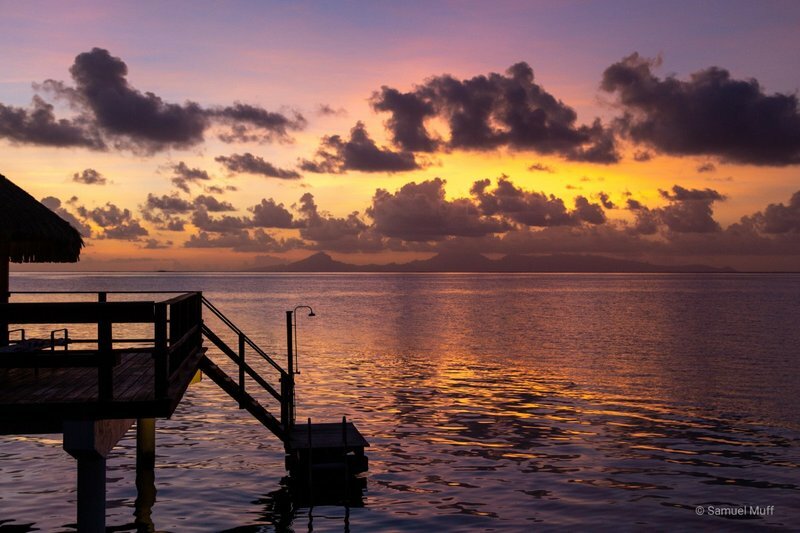 The resort was located in a small bay on the west side of the island, from where we could watch beautiful sunsets with the neighboring islands of Raiatea and Taha’a in the distance. 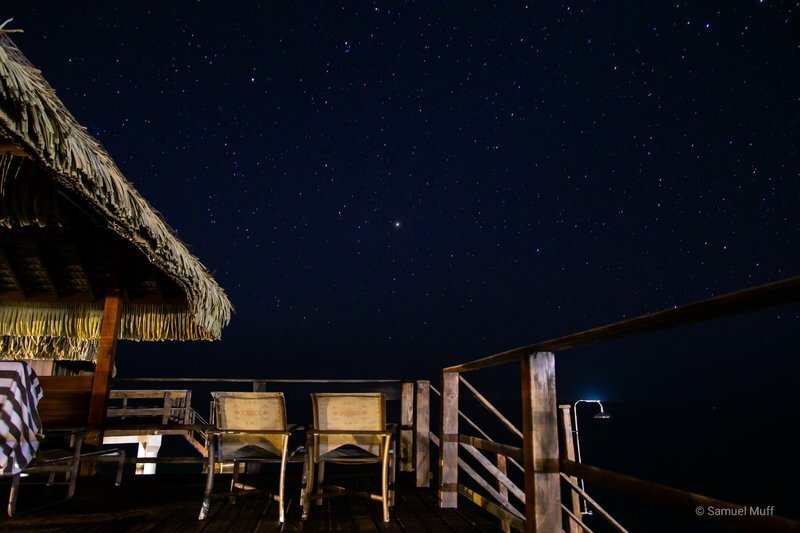 We loved the fact that the resort was quite small and there were no other resorts around, which gave a very quiet and relaxed atmosphere. 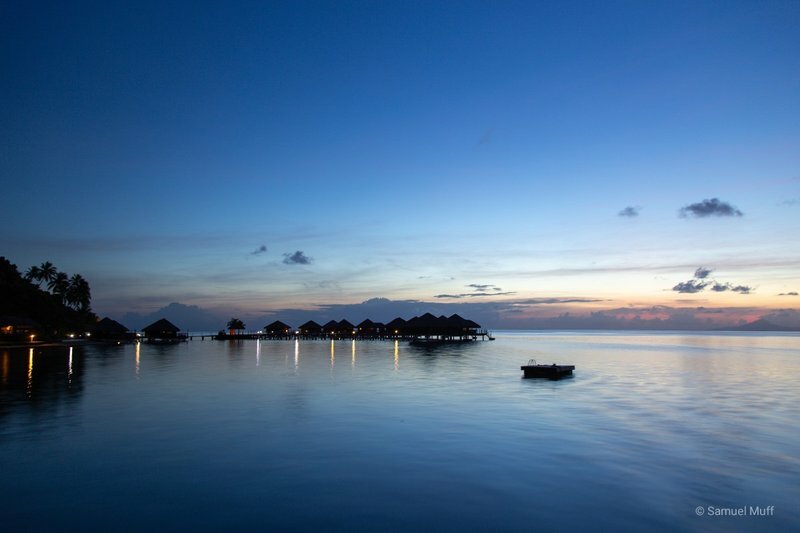 We loved the experience of staying in an overwater villa. We had a large porch, with plenty of shade, which was great for relaxing and watching the sea. 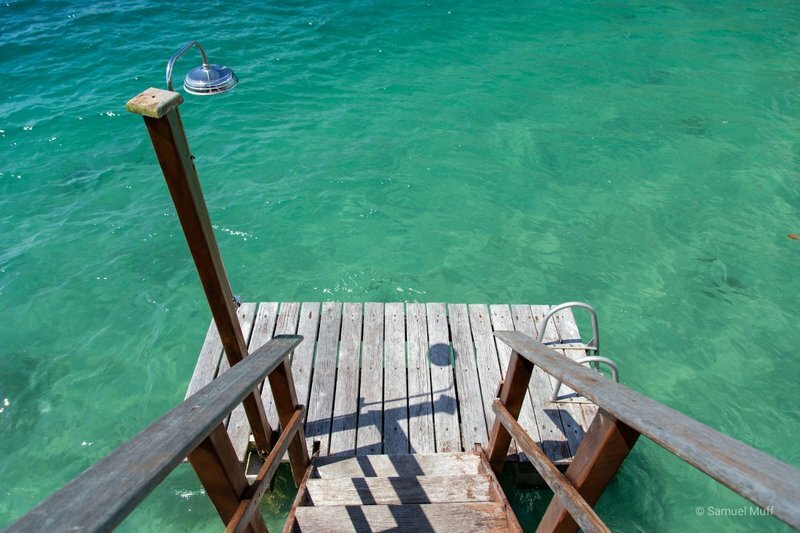 It felt so luxurious to be able to wake up in the morning, walk a few meters, and jump into the water for a swim. A few hundred meters out into the sea was a large protective reef, where we could see and hear the waves brake. Because of this, the water around our resort was calm like a lake and fantastic for swimming. In addition to that, there were beautiful corals all around the overwater villas and we enjoyed many hours snorkeling around them. We saw lots of colorful fish, but nothing larger than an arm. We did not leave our resort a lot in those four days, there was plenty to do there like swimming, snorkeling or kayaking. Only on one day, we walked around the island for a bit. The island has some nice mountains and is extremely green. 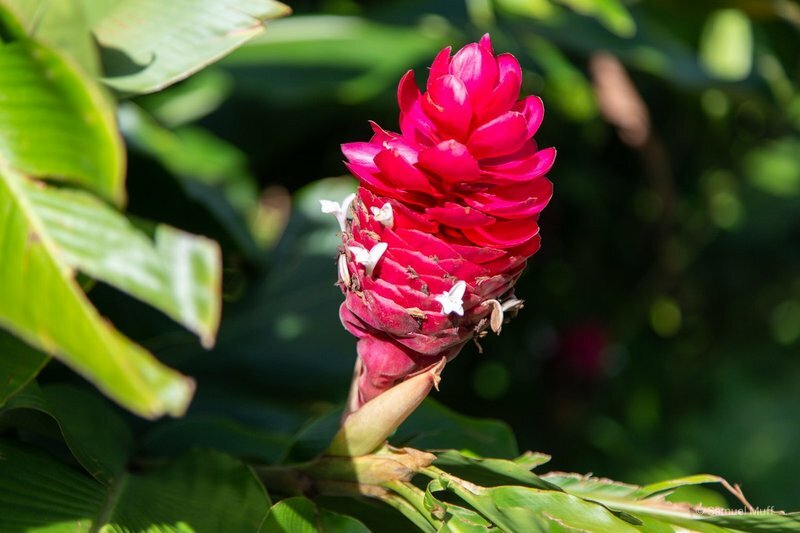 There are huge tropical plants everywhere. 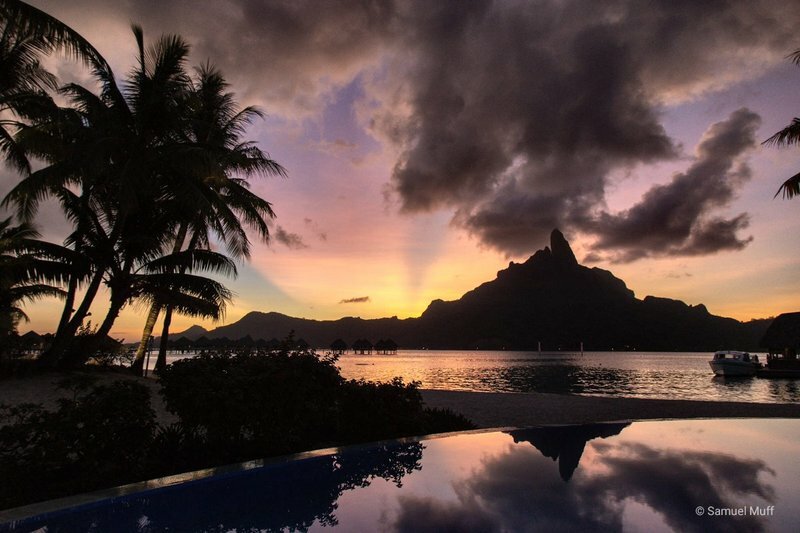 Technically, we visited French Polynesia in the wet season, but we were very lucky. Only on the day of our arrival to Huahine, we had rain in the morning. The rest of the time was sunny and dry.